Humphrey Carpenter’s excellent biography, Tolkien, was published way back in 1977, and it is still considered the best of its kind. I remember reading it shortly after it came out and learning that in 1911, when Tolkien was a young man of 19, he formed part of a group taking a walking tour in the Swiss Alps. It was his first and only experience of really large mountains, and as he later made clear in several of his letters, the experience inspired the mountain landscapes in his Middle-earth writings. The idea was the brainchild of Greg Witt, owner of Alpenwild, a Utah-based tour company specializing in tours of Switzerland: hiking tours, skiing tours, railways tours, culinary tours, you name it. Now he was offering the first-ever Tolkien-oriented tour of Switzerland. I signed up immediately. 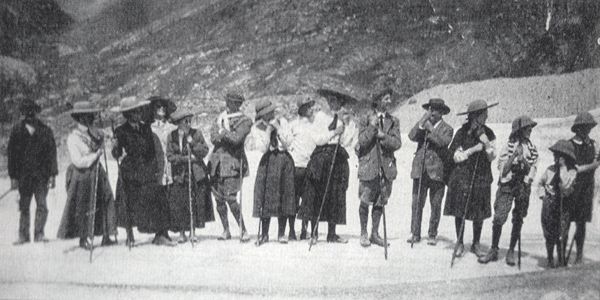 That 1911 tour was one of a series of regular trips the Brookes-Smith family took to Switzerland before World War I; they customarily included any friends who wanted to go. 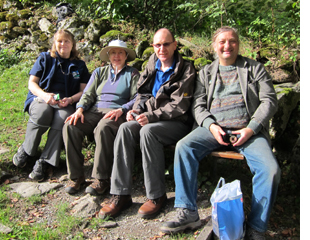 The photo below shows the entire group, with, from right to left: Doris Brookes-Smith, Tony Robson, Colin Brookes-Smith, Phyllis Brookes-Smith, Rev. C. Hunt (of Hurst Green), an unidentified friend of J. R. R. Tolkien, Jane Neave (Tolkien’s aunt), Hilary Tolkien (in the white sweater), an unidentified woman, Tolkien (in a scarf), Jeanne Swalen (a Swiss nanny), Muriel Hunt, Dorothy Le Couteur (a school inspector), Helen Preston (a friend of Jane Neave), and the Swiss guide. That group spent a few weeks traveling, sometime during July and/or August. After our group assembled at the Zurich airport on October 12, we went by train to Interlaken, where the Tolkien tour set out. 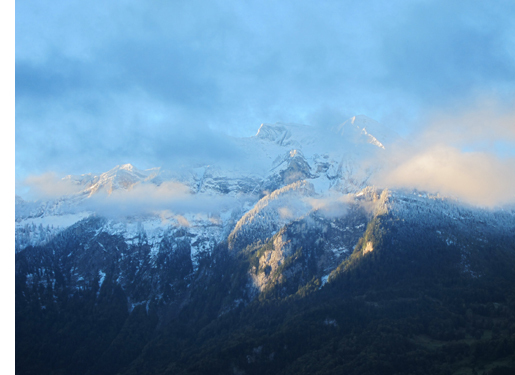 (That image of the “Misty Mountains” at the top was photographed early in the morning from my hotel-room window.) We had only a week, so we took trains between the towns on our route and did short hikes in the areas Tolkien would have seen. Interlaken lies at the northern end of the Lauterbrunnen, a long, deep valley beyond which rise the three famous peaks, the Eiger, Monch, and Jungfrau. The view of the three mountains on the left below was taken from the Alpine village of Mürren, on the opposite side of the valley; Tolkien mentions having visited that village. 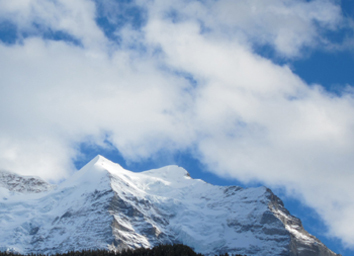 He refers in his letters to the sight: “I left the view of Jungfrau with deep regret, and the Silberhorn sharp against dark blue.” The Silberhorn (below right) is a smaller but dramatic peak on the shoulder of the Jungfrau. It appears as a pyramid shape and is the only Alpine peak covered in snow year round. The Silberhorn became Tolkien’s Celebdril, or the Silvertine. It was there that the Endless Stair, up which Gandalf pursued the Balrog, came to its upper end. There the two killed each other, and eventually there Gandalf was resurrected as the White. Confronted with the real Silberhorn, outlined against blue as Tolkien described it, one could almost picture those fictional events happening there. The Lauterbrunnen is generally assumed to be Tolkien’s inspiration for Rivendell, and its general appearance (left) gibes fairly well with his illustration for The Hobbit. As you can see from these photos, we had incredibly good weather for the trip. I had feared that going in October might mean views obscured by fog and hikes taken through rain, but we were most fortunate. There was an early snowfall just before the tour started, so that all the mountaintops looked picture-perfect. It rained twice, but only at night, so that the main result was to enlarge the many waterfalls (one of which is visible beside the foreground tree in the image at the left), some of which had been a bit feeble when we first arrived. Indeed, our only bit of bad luck came when we took the train up to the Jungfraujoch, the highest train station in Europe. 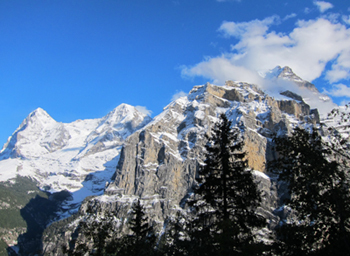 It includes a viewing platform perched on the ridge between the Eiger and the Monch. Ideally we should have had a great view of the Jungfrau and of the glacier behind the Monch (the longest in Europe). Drifting clouds obscured both, however, and the highlight of the visit was a walk through rooms carved inside another glacier right beside the station. Tolkien could not have seen it, for the railway and station were under construction during his visit and did not open until 1912. From there we took a train over the mountains and down to the town of Grindelwald, which Tolkien’s group also visited. Harry Potter fans will recognize the name as having been used by J. K. Rowling for one of the villainous characters in her series. Why, I have no idea, except that she must have liked the sound of it. We didn’t do much in Grindelwald, but we did have one little adventure. Although Tolkien’s references to the 1911 group’s travels suggest that they camped out a lot, Brooke-Smith’s memoirs state that they mostly stayed in inns. There are quite a few inns still functioning that were in business in 1911, one of which is the Gletschergarten in Grindelwald. Greg knew the fourth-generations owners, and they kindly allowed us to look through a visitors’ book from that era. Alas, there were no names of anyone in the Brooke-Smith group registered, but it was fun to do a bit of research. Maybe someday other Tolkien tourists will discover a visitors’ book from another old inn that does contain such a name, and we’ll know a bit more about their activities. From Grindelwald the 1911 group hiked over the Grosse Scheidegg pass and down into the town of Meiringen. We took a very beautiful local bus through the same area. Tolkien doesn’t mention any natural features of the area that inspired him. 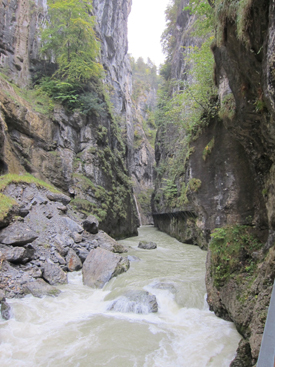 Surely, though, the group visited the Reichenbach Falls, with its Sherlock Holmes associations. There is now a charming little Sherlock Holmes museum in the town, with a lovingly done “recreation” of the parlor at 221B Baker Street. We stayed in the elegant Park Hotel du Sauvage, where Sir Arthur Conan Doyle had Holmes and Watson stay on the night before the fateful encounter between the detective and Moriarty. Doyle, however, renamed it the Englischer Hof. One distinctive feature of the local landscape that we suspected Tolkien must have visited is the Aareschlucht, a mile-long gorge, very deep and narrow, with a river running through it. (See left.) One goes through it along a wooden walkway. The Aareschlucht has been open to visitors since 1888. Alex said that the gorge reminded him of Sarn Gebir, the rapids that the Fellowship encounter before reaching the Argonath. And perhaps this was Tolkien’s inspiration for that stretch of the Anduin. After visiting the Aareschlucht, we deviated from Tolkien’s path for a time, taking the train to Thun, a town with a beautifully preserved medieval-era castle. We then took another train southward through a beautiful gorge that Tolkien’s group definitely saw as he (and we) approached Zermatt. 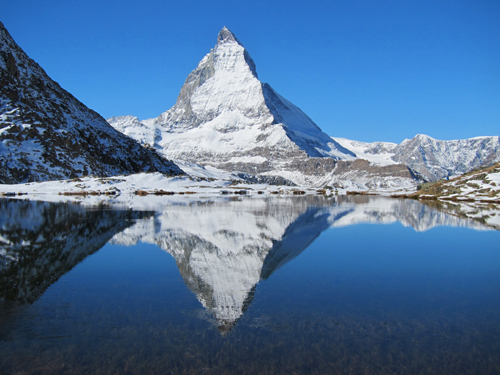 Zermatt is famous mainly as the home of the Matterhorn. Going up to the viewing area at the top of a steep train ride, one can see not only it but also 29 peaks of over 4,000 meters in height. But with its distinctive, jagged shape, the Matterhorn is definitely the star of the show. After admiring it and its surroundings for a while, we traveled two stops down on the train to visit a lovely glacial lake that reflects the mountain beautifully. (See below.) Again we lucked out on the weather. Yes, as the picture shows, there was literally not a cloud in the sky that day. It was warm enough for us to unzip our jackets, and barely a breath of wind disturbed the surface of the lake. Mirrormere (Kheled-zâram)? Again, Tolkien doesn’t specify any inspiration, but that’s what we were thinking of. The next day we took the famous Glacier Express from Zermatt, in far southwestern Switzerland, to Chur, in the east. 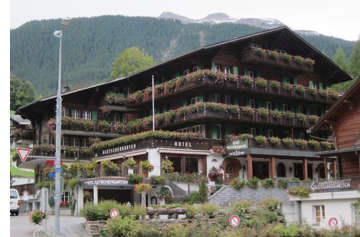 For a while we went through towns mentioned by Tolkien: St. Niklaus, Visp, and Brig. Unfortunately where Tolkien’s group hiked over the Grimsell Pass, we went under it through a tunnel. 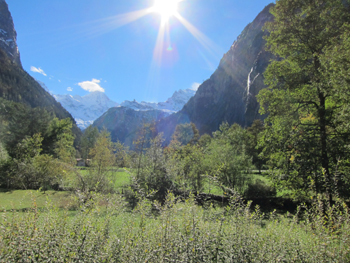 And while he went on to hike the Aletsch glacier, this was one sight that we missed; from the train, it was hidden by mountains. But in parting ways with Tolkien, we were not betraying the mission of our tour. Chur is the town nearest the village of Jenins, where on October 4 the Greisinger Museum, housing the largest private collection of Tolkien artworks, collectibles, and books in the world, opened. Our visit to the museum and the tour we received from its hospitable owner, Bernd Greisinger, deserve a post all to themselves. Coming soon! If you’ve always wanted to follow in Tolkien’s footsteps through the Alps, or if my photos and description inspire such a goal, you’re in luck. Greg is making the tour a regular Alpenwild offering. Already two tours are scheduled for 2014. These will require a minimum number of participants, albeit a relatively low one, so tell your friends. The price may seem a bit high, but we did travel in very comfortable conditions: four-star hotels, excellent meals, and on some days vehicles to take our luggage on to our next hotels. I was a little nervous about the amount of hiking required, but it turned out not to be terribly demanding. I think anyone in reasonably fit condition would be capable of keeping up.